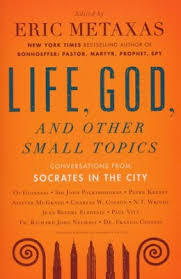 I'm reading the book Life, God and Other Small Topics: Conversations from Socrates in the City, edited by Eric Metaxas. One chapter is a lecture given by N.T. Wright in 2006. I like this description of prayer as being both intimate and awesome. Do you stand in awe of God? Do you know his power and might? Do you have a healthy fear of him? Do you worship him? Do you also have an intimate relationship with him? Do you know his love? Do you know his care? Do you know him as your Father? Because of Jesus’ sacrifice, Christians can approach God the Father with confidence. We can talk to him, and he hears us. We have an amazing God!